Copyright 2003 by Lynne Born. Lynne Born is a long time health activist, writer and independent researcher. The BioShield Bill currently making its way through Congress gives $6 billion dollars of taxpayer money to the major pharmaceuticals to subsidize the development of drugs and vaccines as "countermeasures" to possible biological and chemical attacks. The bill pays for the warehousing of drugs and vaccines for which the FDA has granted a special exemption from the usual approval process to allow the countermeasures to be fast tracked through FDA approval and used on the public with no human testing at all, an unprecedented step for an industry that is already the 3rd leading cause of death in the United States. The pharmaceutical industry sustains a generally excellent reputation as most people believe the drug companies always put safety first in their humane mission to develop medicines to heal the sick. But the facts belie this gentle reputation - between 100,000 and 200,000 people die each year from correctly prescribed medications in the hospital alone, not including drug induced deaths occurring outside the hospital or from incorrectly prescribed medications. Compare these numbers to the 65,000 dead American soldiers during the entire Vietnam war or the 20,000 dead from the initial chemical release in the Bhopal disaster. No other industry is responsible for such a shockingly high death rate repeated year after year, a death rate that would probably cause great alarm and Congressional hearings if it occurred in any other industry. And yet even these numbers are underestimated as David Kessler who ran the FDA for much of the 1990s has stated that from 90-99% of all adverse drug reactions are never reported, which would make the actual death and injury rate from legal drugs astronomical. Looking at Bush's Smallpox Vaccination program reveals the kind of unscientific and fraudulent thinking on the part of the pharmaceuticals that leads to these kinds of death and injury rates. When the program began, Bush called for vaccination of 500,000 health care workers, the so-called "first responders" to a possible biological attack of smallpox. In the months leading up to the program, the mainstream media informed us that the public could expect 1 to 2 deaths per million from the vaccine and a serious adverse reaction rate of 1 in 4,000. However, there is no basis on which to estimate the death and injury rates for adults taking the vaccine since there has never been a single long term study on the safety of the smallpox vaccine, or in fact, on any vaccine, another fact that is consistently suppressed from the public. Because of the exorbitant number of deaths and injuries, multiple states suspended the program in the spring of 2003 and Bush's smallpox program essentially ground to a halt. As of June 2003, approximately 35,000 civilians (including the several hundred embedded reporters) of various ages and health status have been vaccinated, which gives us an initial test group from which to draw some conclusions. Of the 35,000 civilians vaccinated, 3 have died, which makes the death rate 80 times higher than we had been told to expect. And yet even in mainstream media articles about the deaths in the smallpox program, the public continues to be misled with the old, inaccurate numbers rather than the newly updated and much higher death rate. And serious adverse reactions which result in hospitalization, permanent disability and life threatening illnesses including heart attacks, heart inflammation, brain encephalitis, uncontrolled ulceration of the skin and more, turns out to be 1 in 583, 7 times higher than the CDC's original guesstimate of 1 in 4,000. However, it is virtually certain that even these increased death and injury rates are inaccurate and much higher than reported. First, the official definition of "serious" reactions discounts some effects that most of us would consider serious, such as the young, healthy 20 year old volunteers in a test before Bush's program began who stated that the pain in their arm after vaccination was so intense that they wanted to "cut their arm off." There were reports of fevers so high and infections so uncontrolled that antibiotics were given to 30% of the participants. If vaccination occurred on a mass scale as planned, the hospitals would be flooded with hundreds of thousands of acutely ill victims who would be unable to get treatment, overwhelming the system and increasing the death toll. Also omitted from mainstream media is the fact that the federal reporting system is not mandatory, and that the time frame in which adverse reactions are noted is a vague "three to four weeks". As any doctor who treats, or person who has suffered a serious chronic health problem knows, it takes time for the body to develop and display disabling symptoms of a chronic disease. Just because the causative factor is a vaccine does not mean that serious, chronic illnesses will surface quickly and suddenly, or that they will be "easier" conditions to treat than "regular" chronic illnesses. The fact that the causative factor was an avoidable event–the vaccine–is even worse, as the recipients may continue to suffer from serious illnesses such as chronic heart conditions over time, which the medical profession will then deny was related to the vaccine. Because they are not doing any kind of vaccine trial comparing vaccine recipients to a healthy control group, the opportunity to accurately track the first 35,000 has been squandered and future participants are being recklessly endangered. How simple it would be to design and require a mandatory reporting program that allows adequate time for reactions to surface and tracks the recipients of the vaccine for many months and then years, especially since the current recipients are all health care providers who understand the need for, and would be readily available to report back any and all effects. Good science demands it, and it can only be fear of recording the true consequences of the vaccine that is preventing it. Poor and even non-existent adverse reporting systems are standard procedure in the pharmaceutical industry. Most people don't know that the release onto the market of a new drug or vaccine is actually the final phase of the new drug trial called Phase IV. When thousands of people are prescribed a new drug, they are unwittingly participating in the largest, most poorly controlled drug study in the world, as this is generally the phase when the 100,000 to 200,000 deaths per year noted earlier occur. Neither the pharmaceutical industry nor the FDA requires mandatory reporting of adverse reactions or even death - it is entirely voluntary. 40% of all doctors don't even know that an adverse reaction reporting system exists. And in a profound and deadly conflict of interest, the marketing department responsible for recouping the hundreds of millions of dollars invested in developing the new drug is also in charge of tracking and compiling any adverse reactions that would get the drug pulled from the market. This legal but flawed system is why so many deaths occur before the FDA pulls the product from the marketplace, as the delay and obfuscation can mean millions and millions of dollars for the pharmaceuticals before the drug's demise. The premeditated ineffectiveness of tracking systems to monitor vaccine injuries, chronic diseases and death is designed to obscure the unscientific foundation of the entire concept of smallpox vaccination. Dr. Edward Jenner, the creator of the smallpox vaccine in 1796, based the vaccine on a mistaken superstition of the era that milkmaids or farmers who had been infected with cowpox developed immunity to smallpox. (Cowpox is a non-lethal, ulcerative disease on the udders of a cow which sometimes causes ulcers on the hands of milkmaids or farmers who milk them.) But as historical records show, many of Jenner's medical contemporaries immediately disputed his claim by noting that had he polled any number of veterinarians in his county, he could have easily uncovered dozens of cases of smallpox in humans that had followed infection by cowpox. This supposition–that cowpox gives humans natural immunity from smallpox–was never proven by Jenner or any other practitioner of vaccination from his era, and has never been tested or proven by any of the pharmaceuticals who produce the vaccine today. The very basis of the smallpox vaccine is fundamentally flawed. To test his vaccine, Jenner infected six children including his own infant son, with various experimental "brews" including cowpox, swinepox and horse grease–the grease from horses' hooves. His experiments killed an eight year old boy in a matter of days from an uncontrolled ulcerative infection from the "horse grease" vaccine, and the children were never exposed to any smallpox epidemics to test their resistance. Jenner waited only four years before declaring that the vaccine that he named vaccinia provided immunity from smallpox for life! The vaccine was made by slicing the abdomen of a cow, inserting pus from human smallpox, waiting for it to fester, and then making a cut in a human arm and inserting the festering pus from the diseased cow. Because there was no refrigeration, a single strain of the vaccine was sustained by passing it directly from the pustules on human arms to human arms for decades, mixing and combining diseases from countless humans, frequently "pauper" and orphaned children who were used to propagate and maintain the virus. As historical records clearly show, this grotesque practice added virus upon virus to the vaccine as it spread blood-borne illnesses from human to human including leprosy and syphilis, mostly among children who were the main victims of vaccination. There are thousands of documented cases of the vaccine infecting children with syphilis, as for example in Italy in the early 1800s when 64 children were infected in one vaccination incident alone. Because the vaccine frequently caused an uncontrolled syphilitic canker, many doctors of the day considered the vaccine itself to be syphilitic or at the very least, contaminated with syphilis, and even Jenner understood this connection as he treated the vaccine ulcers with mercury, the treatment for syphilis at the time. The practice of vaccinating directly from human arm to arm was not outlawed until the very end of the 19th century, meaning that the majority of the vaccines were created by passing viruses back and forth from human to human, to animal and back to human again for a hundred years. Not only was the vaccine immediately noted for causing injuries and deaths, but doctors of the day emphatically pointed out that it did not prevent smallpox. There are historical records from tests on hundreds of patients from 1802-1810 in which doctors published the results and submitted their statistics of overwhelming death and injury to the government medical board in England. All of these tests occurred outside of Jenner's control and all were abject failures. In 1805 only a few years after the vaccine was introduced, "out of 504 vaccinated in England, 75 died from the vaccine and almost all have had the small-pox, some sooner, some later, after their vaccination", as recounted by Dr. William Rowley, a member of the University of Oxford and of the Royal College of Physicians in London, and Physician Extraordinary to Her Majesty's Lying-in-Hospital. He continued "There is no question here of supposition or calculation of probability, it is truth!" In 1799, a Dr. William Woodville conducted a study on several hundred patients which resulted in many deaths and injuries as a direct result of the vaccine. But when he tried to publish the negative results of the trial, Dr. Jenner himself wrote "I entreated him in the strongest terms, both by letter and conversation, not to do a thing that would so much disturb the progress of vaccination" in an attempt to censor the facts that ran contrary to Jenner's theory. Even as Jenner ignored the evidence of harm and helped to suppress the facts, he was already receiving government funding by an Act of Parliament who had funded him in the hopes that a cure for smallpox had been found. When the hundreds of reports of injury and death were published during the early years of vaccination, the government should have admitted to funding a faulty program and ended it. Instead, they invested £20,000 in 1807 and £3,000 per year thereafter, accepting as "science" the claim that a procedure only seven years old would protect from smallpox for life thereby making vaccination a permanent source of income for the medical profession. If it seems unbelievable that the government of England should fund a medical procedure that not only didn't work but actually caused serious harm, we need look no further than our own pharmaceutical industry and government of today for the same pattern. Drugs continue to be marketed even after they have been shown to cause death and injury, and Bush continues to push his smallpox program by offering $100 million to state programs to proceed even after the astronomical percentage of deaths and injuries from the first phase of the program, while censoring, obscuring and rewriting the terrible science underlying this vaccine. Just as now, once vaccination became entrenched in the medical society, doctors found a new and lucrative source of income and industries sprang up which produced the vaccine both by continuing the human to human method and by going back to the cow to produce supposedly "pure" cow vaccine. However, in a test of thirteen different brands of vaccine in 1900, not one was found to be bacteriologically pure and in some, hundreds of colonies of teaming germs were found. Just as there exists a controversy today about the safety and efficacy of vaccines, Jenner's medical contemporaries immediately formed a vocal Anti-Vaccinationist resistance movement to speak out against the "transplanting of disease back and forth from animal to human." Voluminous historical records display excellent science, careful thinking and methodical observations of the vaccine and a record of the same kinds of adverse reactions and deaths we see today. They noted brain swelling and encephalitis, paralysis, blindness, increased incidence of tuberculosis and pneumonia, and progressive vaccinia in which the ulcerative sores caused by the vaccine spread over the whole body down to the bone and organs causing a terrible and painful death, some in a matter of days after the administration of the vaccine and some over an extended period of suffering. One such case was described in 1855 by a Dr. R. T. Trall who stated, "I have seen within the last year a most horridly loathsome case ... in which the patient literally rotted alive at the age of 15, from unhealthy virus [vaccine] received when he was but three years of age." (As grotesque as it may seem, the bodies of the victims were so overrun with the deadly virus that they frequently decomposed in a matter of hours as if the corpse had been dead for weeks.) Today this condition is called "progressive or generalized vaccinia" where the ulcer that forms at the vaccine site grows uncontrollably – we have had three cases during Bush's program that we are aware of. (See accompanying picture.) That it took 12 years in this case for the vaccinia virus to progress to death shows again how it takes time for the full effects of the vaccine to develop, and because of the limited time frame involved in Bush's smallpox program, that death would never be attributed to the vaccine even though the illness began directly after receiving it. The number and type of adverse reactions were so consistent and so numerous that physicians actually named the condition "Vaccine Disease", a recognized diagnosis that carried with it a defined and universally recognized set of symptoms. Dr. Stowell spoke for many doctors of his day in 1870 when he said "...it is irrational to say that any corrupt matter taken from boils and blisters of an organic creature could affect the human body otherwise than to injure it." 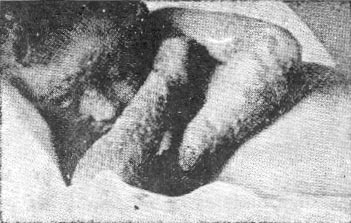 Child's	arms ulcerated to amputation by Progressive Vaccinia in the 1800's. Fatal Progressive Vaccinia in the 1900's. By the 1850's, much of Europe made vaccination mandatory under threat of fine and imprisonment and it is during these years that we can truly see not only how ineffective the vaccine was at stopping the spread of smallpox but that the vaccine actually increased the incidence of smallpox. (See accompanying chart.) If the science of vaccination worked, it should have prevented epidemics in the first place but instead, while the population of England increased 16% during the years of compulsory vaccination, smallpox deaths increased 160%, a figure that does not include the deaths from the vaccine itself. Using official records from government medical registries from town after town in Europe, the same pattern is repeated over and over of increased incidence of, and death from, smallpox among the vaccinated. Before vaccination was made mandatory in England, the highest recorded death rate from smallpox was 2,000 for any two year period. However after 20 years of compulsory vaccination when nearly all of the population had been vaccinated (96.5% from age 2 to 50), the death rate during the epidemic of 1871 was 23,000. Germany (Prussia) was over 95% vaccinated, enforced multiple revaccinations every few years and kept the best vaccination records in Europe. Yet they still recorded over 1,000,000 cases of smallpox during the 1871 epidemic, suffering the highest death rate in all of Europe of 124,000, all of whom had been registered as vaccinated. As the Chancellor of Germany said at the time, "the hopes placed in the efficacy of the cowpox virus as a preventative of smallpox have proved entirely deceptive." In report after report from city and health officials, hospital records repeatedly show 90% and more of smallpox patients had been fully vaccinated. And in a report published in the British Medical Journal, Dr. L. Parry analyzed vaccination statistics from the 19th century concluding, "smallpox is five times more likely to be fatal in the vaccinated as in the unvaccinated." Anti-Vaccinationists pointed to the town of Leicester, England for proof that vaccination actually increased smallpox deaths. Leicester suffered 3,500 deaths per million of its 95% vaccinated population during that same epidemic of 1871 but when the people saw how many suffered and died from the vaccination itself, and then how many of the fully vaccinated died during the epidemic, they rose up in unison with their town officials and became the first town in England to officially resist mandatory vaccination. Dire predictions of catastrophe and death from pro-vaccinationists followed, but instead, in less than 20 years the numbers reversed and 95% were unvaccinated. When individual outbreaks of smallpox occurred, they were isolated by the community and given quality medical care and general assistance instead of vaccination. No case of smallpox ever grew into an epidemic again, giving Leicester the lowest smallpox mortality rate of any town in England. 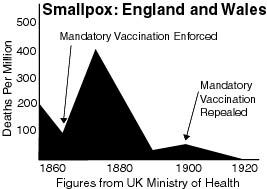 By the 1890's, resistance to mandatory vaccination was so fierce in England that Parliament empowered a Royal Commission to try and understand why England was still experiencing smallpox epidemics even though the vast majority of its population was vaccinated. The great scientist and thinker Alfred Russel Wallace, a colleague of Charles Darwin, was invited to report to the Commission on the safety and efficacy of smallpox vaccination. The evidence submitted by Wallace and the other Anti-Vaccinationist doctors showed overwhelmingly that cowpox had never been proven to provide immunity from smallpox; that an impure and dangerous vaccine was created by both passing diseased pus from human to human and from diseased cow matter; that the vaccine did not prevent smallpox; that revaccination did not prevent smallpox; that the vaccine itself was causing multiple injuries and deaths; that the vaccine actually increased the incidence of smallpox; and that the reporting system for smallpox injury and death was inadequate because the numbers of deaths and injuries from the vaccine were vastly underreported. Through the sustained resistance of the Anti-Vaccination movement, mandatory vaccination was finally repealed in England in 1898. While these facts stand in stark contrast to all we have been taught about smallpox epidemics, in reviewing original historical medical sources, publications and statistics from the past two hundred years, it becomes clear that infectious diseases other than smallpox declined 90% before mass vaccination was ever introduced. The decline in smallpox was actually delayed by vaccination and the cessation of vaccination did more to end smallpox than vaccination ever did. Instead, medical experts of today and the past attribute the cessation of all epidemic diseases such as measles, scarlet fever, whooping cough and diphtheria to improvements in sanitation and nutrition. Just prior to 1800, a major sanitation reform movement designed and implemented drainage systems to move human waste out of the streets where it currently flowed and into plumbing systems; to regularly clean streets and stables of horse manure and human waste; to improve roads so that vegetables and milk could be transported to cities and distributed while fresh; and to upgrade the water supply to prevent bacterial contamination. All the old terror diseases such as plague, black death and cholera responded to these reforms without vaccination and all epidemics declined throughout the 1800's except for smallpox, which surged with mandatory vaccination and declined only after it ended. After the massive epidemic of 1871, Germany embarked on a national campaign to clean their cities and build a drainage system throughout the entire country which finally caused smallpox to become virtually extinct in less than 30 years, something which mandatory vaccination did not accomplish in 60 years. Even the CDC reported in 1999 that infectious diseases declined in the past century due to improvements in sanitation, water and hygiene. An extraordinary number of scientists and first-class thinkers have objected to vaccination since its creation including Gandhi, George Bernard Shaw, Voltaire, Mark Twain, and in the 20th century, Henry Ford and Thomas Edison. In the United States, over 300 children (that we know of) died from the smallpox vaccine between 1948 and 1971 while there wasn't a single reported case of smallpox! Professor Ari Zuckerman, a member of the World Health Organization's advisory panel on viruses stated "Immunization against smallpox is more hazardous than the disease itself," and the American Medical Association, the Association of American Physicians and Surgeons, the American Academy of Pediatrics and the American Academy of Family Physicians all recommended against use of the smallpox vaccine. And even though the World Health Organization claims credit for the eradication of smallpox worldwide through vaccination, the facts tell us that smallpox declined in countries around the world whether the population had been vaccinated or not. As Australian Dr. Glen Dittman said in 1986, "It is pathetic and ludicrous to say we vanquished smallpox with vaccines, when only 10% of the population were ever vaccinated." The history of the smallpox vaccine and the resistance movement against it becomes extremely informative now that history is repeating itself in the passage of the Homeland Security Bill and state laws called the Model Health Emergency Powers Act (MEHPA). MEHPA and Section 304 of the Homeland Security Bill function like the Patriot Act of healthcare, except instead of depriving us of our civil liberties, they deprive us of our most fundamental right of all - the ownership of our own bodies. Section 304 makes mandatory vaccination and other medical treatments legal once again, making refusal a crime punishable by fine and/or prison. It calls for forced quarantine and isolation of individuals and even entire cities, allows for the confiscation of property of anyone who refuses treatment and authorizes the military to enforce the medical treatment or quarantine. An actual act of bioterrorism isn't even necessary, a "potential" emergency will suffice such as the current smallpox delusion in which Americans are injected with the most dangerous vaccine in history for protection against a disease that died out over 30 years ago and for which no credible threat of its use as a bioweapon has ever been received. (Note that during mandatory vaccination in England, an average of 2,000 parents a year were prosecuted and jailed for refusing to allow their children to be vaccinated and hundreds had their homes and possessions confiscated.) This power to inject our bodies with toxic poisons like the smallpox vaccine rests entirely with two individuals - Health and Human Services Secretary Tommy Thompson and President Bush. In a cynical move that protects the government and manufacturers from the history of deception and bad science, no public figure can be held accountable for any harm or death that the medical procedure may produce. This protection extends to the manufacturer of the vaccine, eliminating any financial incentive to create a safe vaccine or responsibly investigate the efficacy of any vaccination program. The fraudulent science of the smallpox vaccine and the draconian laws of the Homeland Security Bill set the stage for a radical revision of the mission and purpose of the pharmaceuticals. 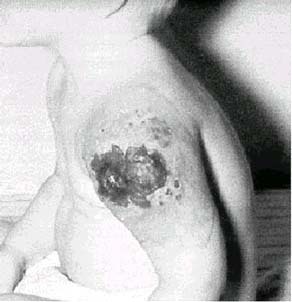 Ominously, the first bioterror countermeasure that the BioShield bill calls for development is another smallpox vaccine that uses the same, deadly vaccinia virus in the current vaccine but has additional dangerous potential effects because it is genetically engineered, another science that has a dark history of injuries, diseases, deaths and cover-ups. The bill also calls for development of bioterror drugs and vaccines in response to anthrax, botulinum toxin, plague and ebola. In order to develop drugs and vaccines that are supposed to respond to biological and chemical warfare agents, the companies will have to create and store the actual agent itself. Until now, bioweapons have been handled and stored at labs such as Fort Detrick, labs which are supposed to operate under strict controls with guidelines for safety set out by the U.S. government (not that the government labs have been models of efficiency as their poor past record and accidental releases have shown). But the BioShield bill sets out no provisions for the handling of these agents or any safety measures at all, even though the Bill effectively turns the pharmaceuticals into new bioweapons factories. $6 billion dollars may be a small price to pay if the pharmaceuticals can accomplish the goal as set out in the bill - to protect us from biological and chemical attack. But common sense tells us, any country technologically advanced enough to create, store and modify a bioweapon for release would be competent enough to alter or genetically engineer it in any number of ways that would make the creation of a drug or vaccine to that particular strain of bioweapon impossible. Will the bioterrorists really be so cooperative as to create only those few weapons for which the pharmaceuticals have developed and warehoused countermeasures? Since the pharmaceuticals said it would be unethical to test bioweapon countermeasures on humans and pushed the FDA for the exemption from human testing, why is it ethical to use the Homeland Security Bill to force people under threat of imprisonment, fine or quarantine, to take these same untested medicines? The Bush Administration is perpetrating a Pharmaceutical Scam justified by the "war on terror", rewarding the pharmaceuticals for the $262 million they invested to get Bush elected, more than any other industry. The bill substantially enriches the pharmaceuticals by creating a virtually endless supply of cash for the creation of untested drugs and vaccines to be warehoused for possible use against the public. Tommy Thompson's stated goal is that every "American man, woman and child will have a vaccine with their name on it", and hundreds of million of dollars are being invested to bring that goal to reality even as the deaths and injuries in the current program continue to mount. He has stated that even one case of smallpox will unleash a massive program of forced vaccination through the Homeland Security bill, vaccinating or quarantining every American to "protect" them from the uncontrolled threat. But there is no historical precedent or evidence to support the notion that one person infected with smallpox will set off an chain reaction infecting millions and millions of people. And a compliant media disseminates every myth the government feeds it without checking any sources or seeking precedents. A tragic situation has been created in which the best scenario for the American people is that their money will be wasted by letting these untested vaccines remain forever warehoused, although the best scenario would have been not to create them in the first place and instead spend the money on real health care problems. But the precedent was set when they pulled the 40 year old smallpox vaccine out of the warehouse and without even a hint of a threat of smallpox attack, released it on the US population, making the Bush administration the real bioterrorist. As Dr. Benjamin Rush, signer of the Declaration of Independence and physician to George Washington said ten years before the creation of the smallpox vaccine, "Unless we put medical freedom into the Constitution, the time will come when medicine will organize into an undercover dictatorship."